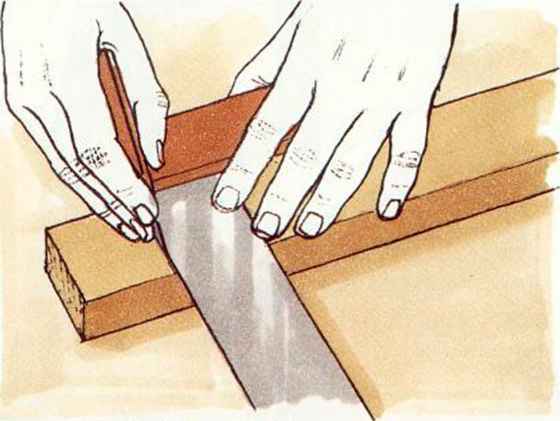 Cut the tenon for a standard joint to approximately one-third the thickness of the railthe exact size being determined by the chisel used to cut the mortise. 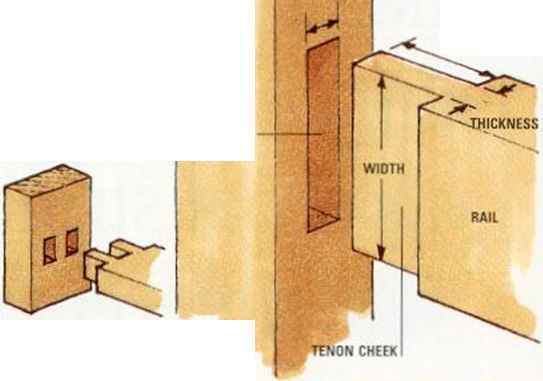 Tenon thickness can be increased when the leg or mortise member is thicker than the rail. 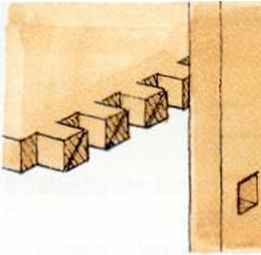 A tenon normally runs the full width of the rail but, should the rail be unusually wide, it is best to incorporate a pair of tenons, one above the other, to avoid weakening the leg with an excessively long mortise. 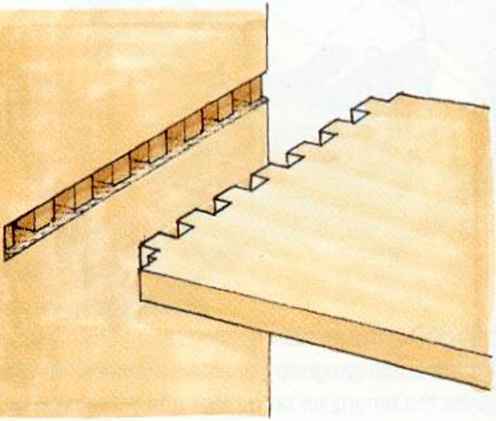 This type of joint is known as a double mortise and tenon. 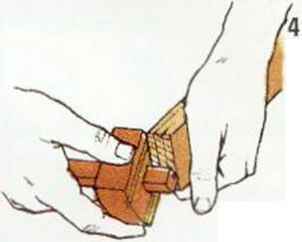 Twin tenons, cut side by side, are required when a rail is set horizontally. Make the depth of a stopped mortise about three-quarters the width of the leg or stile. The through joint, where the tenon passes right tlirough the leg, is used a great deal for constructional frames of all kinds. With the end grain showing, possibly with wooden wedges used to spread the tenon (see page 72), it is an attractive, business-like joint. Always cut the mortise first, since it is easier to make the tenon fit exactly than the other way round. 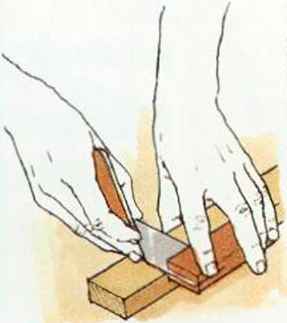 Mark the position and length of the mortise, using the rail as a template. Square the lines all round with a pencil. Set a mortise gauge to match the width of the mortise chisel to be used, and then scribe the mortise centrally between the squared lines on both of its edges. 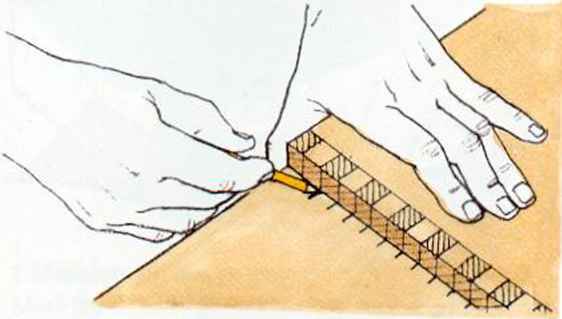 Mark the shoulders on the rail, allowing for slightly overlong tenons that can be planed flush when the joint is complete. Score the shoulder lines with a marking knife. Without adjusting the settings, use the mortise gauge to scribe the tenon on both edges and across the end of the rail. 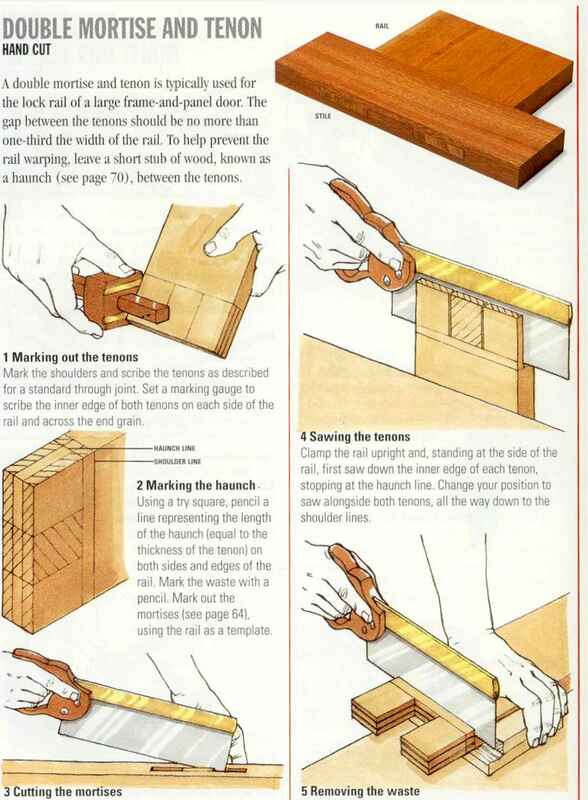 Holding the rail on a bench hook, remove the waste by sawing down the shoulder line on each side of the tenon. If necessary, pare the sides of the tenon with a chisel until it fits the mortise snugly. Clamp the work to a bench so that you can stand at one end of the stile. Holding the • chisel vertically, drive it 3 to 6mm (Vs to Ym) into the wood at the centre of the marked mortise. Work backwards in short stages, making similar cuts and ensuring you stop about 2mm (M6in) from the end of the mortise. Clamp the rail in a vice, set at an angle so that the end grain faces away from you. Saw down to the shoulder on the waste side of each scribed line. Turn the work around and saw down to the shoulder line on the other side of the tenon. Clamp the work upright and saw parallel to the shoulder on both sides of the tenon, taking care not to overrun the marks. Turn the mortise chisel around and chop the wood in stages towards the other end of the mortise. Lever out the waste with the chisel, then chop out another section of wood until you have cut halfway through the stile. Pare the ends of the mortise square, then turn the work over and, after shaking out any loose wood chips, clamp the stile down again so that you can chop out the waste from the other side of the joint. 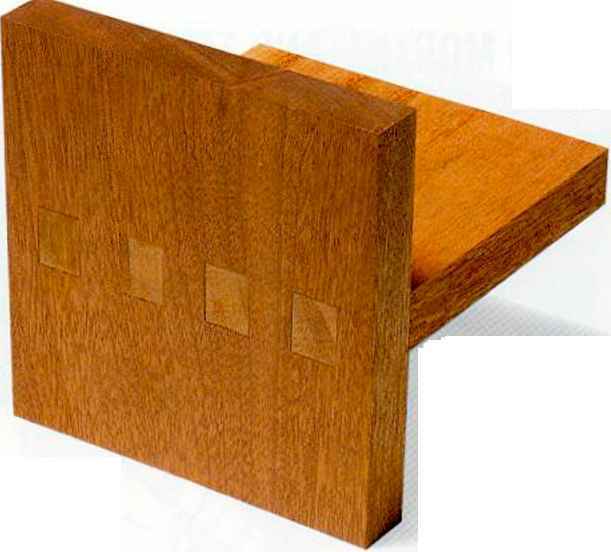 A double mortise and tenon is typically used for the lock rail of a large frame-and-panel door. The gap between the tenons should be no more than one-third the width of the rail. 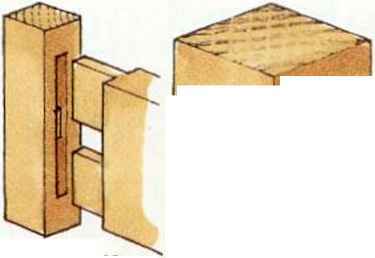 To help prevent the rail warping, leave a short stub of wood, known as a haunch (see page 70), between the tenons. Mark the shoulders and scribe the tenons as described for a standard through joint. Set a marking gauge to scribe the inner edge of both tenons on each side of the rail and across the end grain. Clamp the rail upright and. standing at the side of the rail, first saw down the inner edge of each tenon, stopping at the haunch line. Change your position to saw alongside both tenons, all the way down to the shoulder lines. 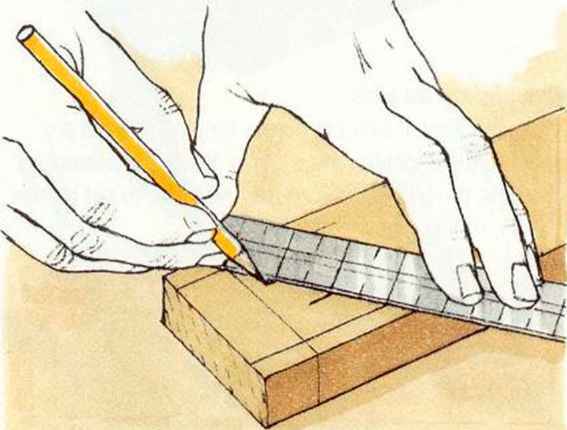 Using a try square, pencil a line representing the length of the haunch (equal to the thickness of the tenon) on both sides and edges of the rail. Mark the waste with a pencil. 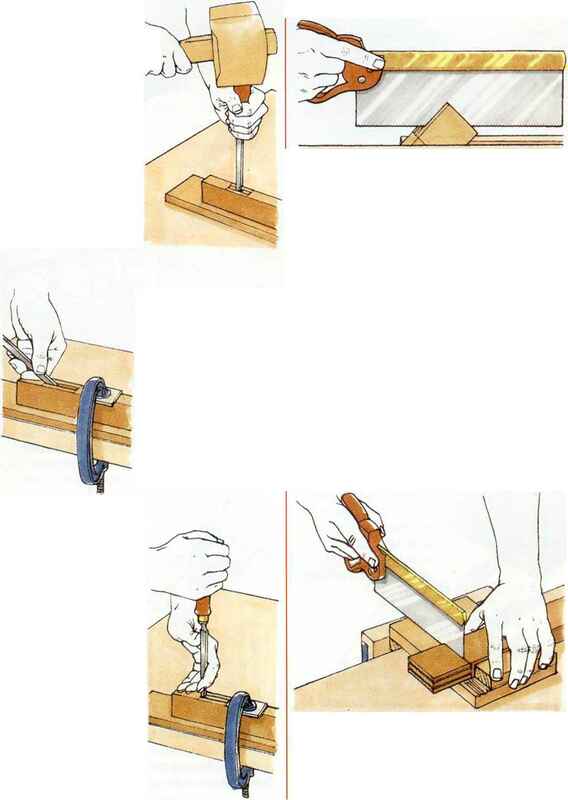 Mark out the mortises (see page 64), using the rail as a template. 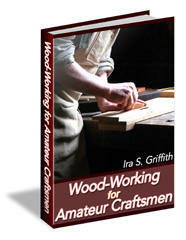 Chop out both mortises as described on page 65, then run a saw blade alongside the haunch lines gauged between them. Chisel out the waste between the saw cuts, down to the level of the haunch. Cut out the wood from between the tenons, using a coping saw, then saw the shoulder on each side of the joint to remove what is left of the waste. The twin mortise and tenon is used when a rail, turned on its side, is jointed into the face of a leg rather than its edge. It is also commonly used for drawer-rail construction. Depending on the section of the rail, there may be a pair of tenons cut to standard proportions, or two relatively thick pin tenons (see page 68). As a rule, make each tenon as thick as the gap between them. Having squared the shoulder lines all round, make a pencil mark not less than 6mm (1/iin) from each edge, then divide the space between into three, to give a pair of tenons and the gap between them. Modify the thickness of the tenons to match a suitable chisel. Set a mortise gauge to the above dimensions, and scribe the tenons on both faces and across the end of the rail, working from both edges. Square two lines across the work to mark the top and bottom of the mortises, then scribe lines between them to mark the sides of the mortises, using the marking gauge. If the mortises are to be cut into a wider rail or panel, leave the pin settings alone but adjust the tool's stock to mark both mortises from one edge. Chop out the mortises as described on page 65. 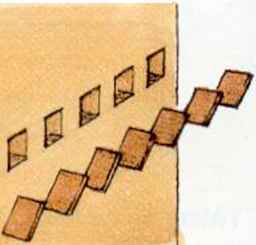 Saw down beside each tenon, following the scribed lines, then cut off the waste wood from both edges of the rail by sawing along the shoulder lines. 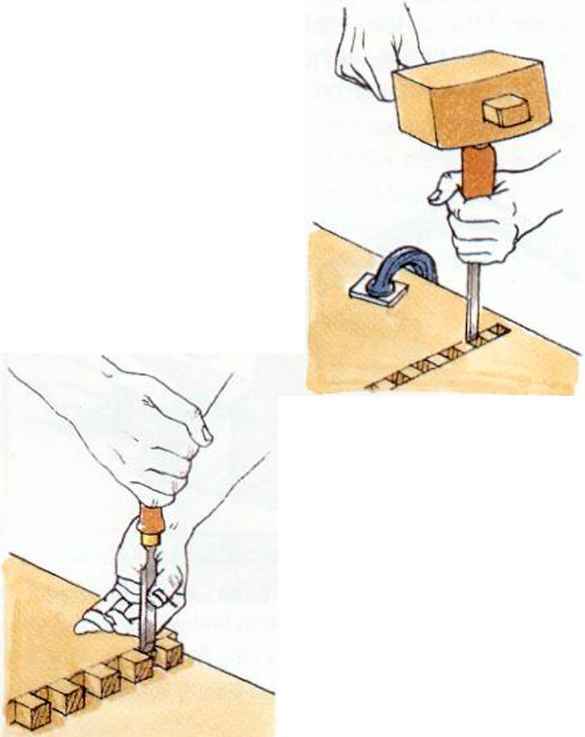 Remove the waste from between the tenons with a coping saw and chisel (see also page 68). Make a diagonal saw cut across the end of each pin, down to the shoulder line. Having glued and assembled the joint, drive in glued wedges and leave to set before planing them flush with the panel. Chop out the through mortises (see page 65), working from both sides of the panel. 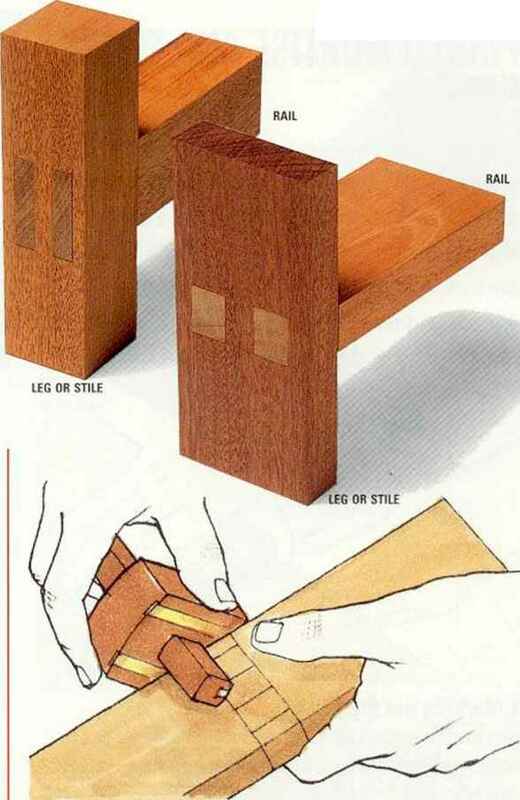 How to make a double mortise and tenon joint? Can a mortise machine cut a round mortise? What tool is used to cut mortises or sections in wood?